Of the contracts reviewed, 130 were agreed to after the 2011 reforms took effect. Contracts that were agreed to before July 19, 2011, were reviewed as well, as they provide a control variable of sorts — they are examples of the type of contract language that was common in collective bargaining agreements prior to the reforms. 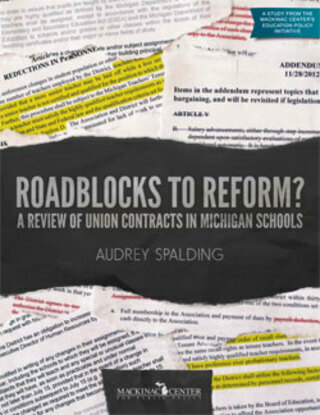 The first section, “Contract Confusion,” discusses some of the methods school districts used to change their contracts in response to the 2011 reforms. There were a variety of approaches, but many of them wound up preserving prohibited language in union contracts. The sections that follow describe the implementation of two of the major components of reform: Seniority-based placement and retention policies and teacher evaluations. Many of the implementation issues that are discussed regarding one of these policies are consistent throughout the same contract. In other words, readers can safely assume that districts used similar tactics when dealing with other prohibited subjects of bargaining aside from those addressed in this survey. [*] Districts were ranked by their 2012-13 student enrollment fall headcount. “2012-13 Pupil Headcount Data (MSDS)” (Center for Performance and Information, 2014), accessed Feb. 7, 2014, http://goo.gl/ieFqds. This survey did not include districts that were dissolved, combined, or newly established. [†] The surveyed districts enrolled 1,067,549 students of Michigan’s 1,529,887 public school students in 2012-13. “2012-13 Pupil Headcount Data (MSDS)” (Center for Performance and Information, 2014), accessed Feb. 7, 2014, http://goo.gl/ieFqds.